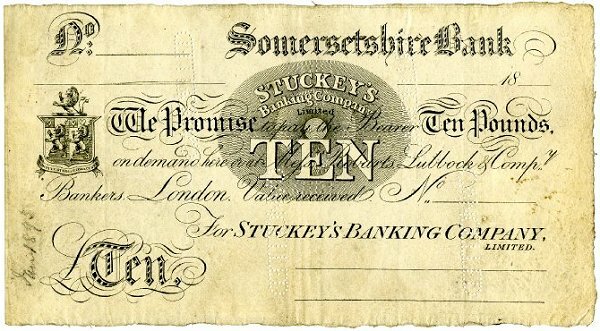 Stuckey’s Bank, a joint stock bank and the second to be formed in the country, was created in 1826 by the amalgamation of three Stuckey family banks – Stuckey, Lean, Hart & Maningford of Bristol, S & G Stuckey & Co of Langport and Stuckeys & Woodlands of Bridgwater – along with the private Bristol bank of Ricketts, Thorne & Courtney. The banks continued to trade under their separate names until 1828 when all became part of Stuckey’s Banking Co. The early policy of the bank was to expand throughout Somerset and Bristol by acquisition of private banks and by branch and agency openings. Initially based in Langport, it became a major West Country bank under the leadership of Vincent Stuckey. The private banks absorbed were Payne & Co and Sparkes & Co, both of Crewkerne, in 1829; Waldron, Walters & Co of Frome and Trowbridge in 1833; Henry Whitmash & William Lambert White of Yeovil and Wincanton in 1835; Reeves & Co of Glastonbury and Shepton Mallet in 1835; Tufnell, Falkner & Co of Bath in 1841; U, G & H Messiter of Wincanton in 1844; J & H B Batten of Yeovil (the Yeovil Old Bank) in 1849; H, H J & D Badcock of Taunton in 1873; Kinglake & Co of Taunton in 1838; and Dunsford & Co of Tiverton in 1883. The latter acquisition marked the beginning of expansion outside Somerset. The Yeovil branch of Stuckey's Bank operated in the old Whitmash & White bank building next to the old Angel Inn in Hendford. 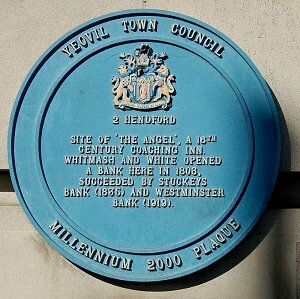 But, to quote Vickery "In a few years the premises became too confined for properly carrying on the increasing business of the establishment; and the company, having previously purchased the adjoining property, including the site of the Old Angel Inn, and thrown back its frontage several feet, after compensation from the Town Commissioners, on the 8th of June 1844, in the persons of H. Penny and John Mayo, Esqrs., laid the foundation stone of the present very elegant and substantial building. The Architect was Mr Davis, of Langport." The new building is photographed below. In about 1831 a London firm, named Stuckey, Reynolds & Co, was opened. Walter Bagehot, later to be a distinguished political economist, was secretary of the bank from the 1850s. In 1874 the first published balance sheet showed a paid-up capital of £278,000 (about £22 million at today's value) and a balance sheet total of £4.29 million (about £350 million at today's value). 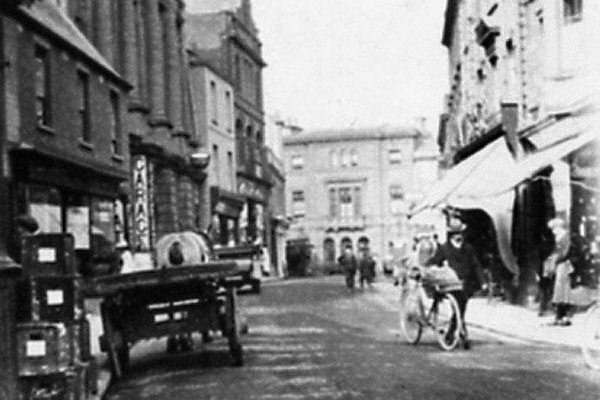 In 1892 limited liability was acquired and in 1908 the head office was moved to Taunton. By 1909 34 branches and 35 sub-branches were operating but in that year the bank amalgamated with Parr's Bank. It then had 47 branches and 24 sub-branches, a paid-up capital of £408,000 (about £36 million at today's value). The bank building of the photographs below was demolished in the early 20th century and the Westminster bank was opened in today's building, built in Portland Stone, in 1919. The obverse of an undated Stuckey's Bank £10 note. Actual size = 206mm x 104mm. 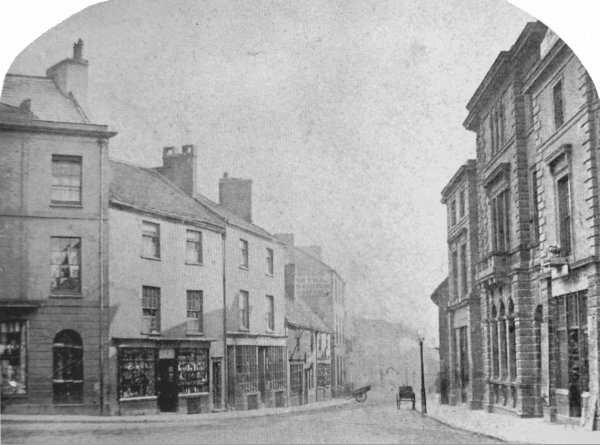 This photograph, one half of a stereoscopic pair, was taken around 1870 and looks down Hendford with High Street at extreme left. At right is Stuckey's Bank, facing High Street. This postcard, postally unused, I'd guess dates to about 1895. At extreme left is just seen the edge of Linsey Denner's shop and next to it are the remaining shops before he took them over. The two men at centre are standing outside Stuckey's Bank (demolished before 1918) and between the bank building and Genge's shop is the narrow entrance to Porter's Lane (later widened to become today's Westminster Street). A cheque issued by the Yeovil branch of Stuckey's Banking Co Ltd in 1905. 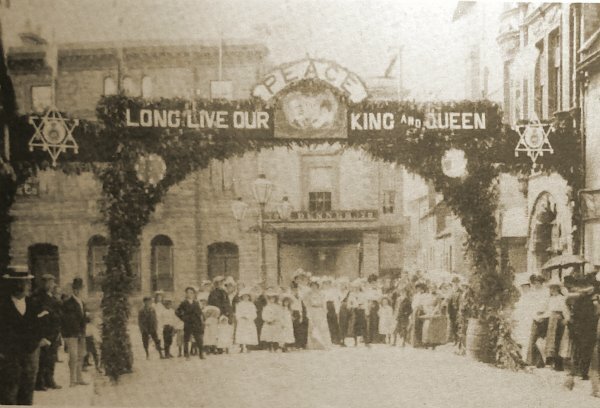 This photograph looks along High Street to Hendford - the triumphal arch was the highlight of the town's decorations of the 1902 coronation of King Edward VII and Queen Alexandra. 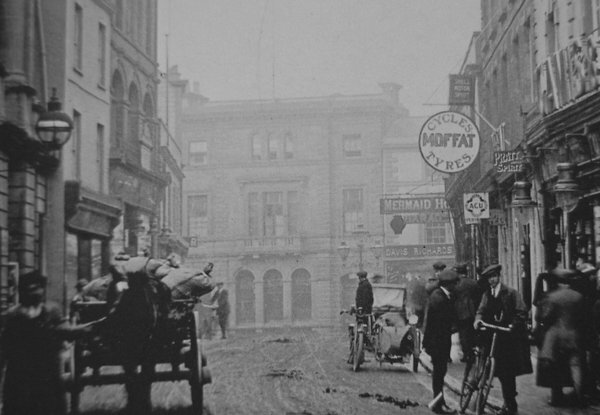 In the background at left is Stuckey's Bank and at centre is Linsey Denner's "gentleman's and juvenile ready-made and outfitting establishment". Note to its immediate right the very narrow entrance to Porter's Lane. Stuckey's bank was later demolished and the present Westminster bank was opened in today's building in 1919. Denner's building was also demolished and Porter's Lane was widened to become Westminster Street as seen below. 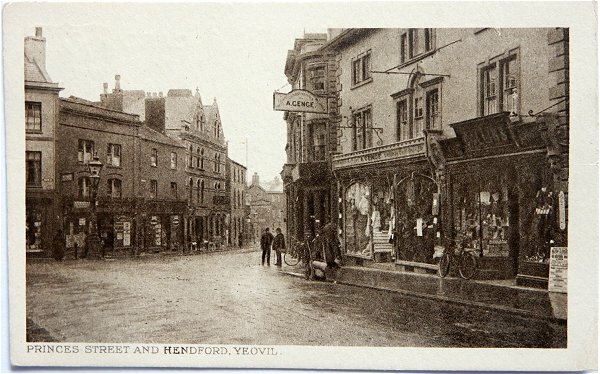 This photograph dates to about 1910 and looks along High Street to Hendford. Stuckey's Bank is the building facing the photographer. Although the Western Gazette date this photograph to 1920, it must have been taken a year or two earlier than that because it shows Stuckey's Bank at centre - demolished and replaced by today's Westminster Bank building that opened in 1919.